Author Ruth King says what needs to be said. If we continue to give the very word race the power and the fear that it's had thus far, then we choose to let it pull at the American tapestry. This country was not born in a vacuum. Unless we mention certain explorers, then we have to know that we were born of different races and we have grown in that direction. In fact, one of psychic Sylvia Browne's predictions was that one day, we would all have skin a lovely mocha color because of the mixing of races. What then organization's of hate? King states that racism is a curable heart condition. King notes the importance of being mindful of the hurt that we put onto one another. So needless. So. On. Time. Ruth King is a core teacher at Tara Brach’s Insight Meditation Community and the Spirit Rock Meditation Center, and the founder of the Mindful Members Practice Community in Charlotte, North Carolina, where she resides. At Levi Strauss, Intel, and other organizations, she coached executives and sta? 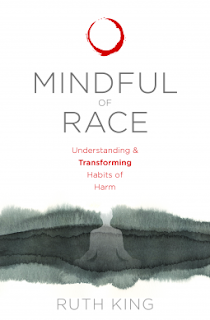 in transformative leadership and the awareness of racial wounding and its healing. She is the author of Healing Rage: Women Making Inner Peace Possible (Gotham, 2007).